Welcome to Decembers Helpful Hints. "Humbug I tell you; humbug!" At this, the spirit raised a frightful cry, and shook its chain with such a dismal appalling noise, that scrooge held on tight to his chair, to save himself from falling in a swoon. But how much greater was his horror, when the phantom taking off the bandage round its head, as if it were too warm to wear indoors, its lower jaws dropped down upon its breast! "It is required of every man," the ghost returned, "that the spirit within him should walk abroad among his fellow-men, and travel far and wide, and if that spirit goes not forth in life, it is condemned to do so after death. It is doomed to wander through the world - oh, woe is me! - and witness what it cannot share, but might have shared on earth, and turned into happiness!" "I wear the chain I forged in life," replied the ghost. "I made it link by link and yard by yard; I girded it on my own free will, and of my own free will I wore it. Is its pattern strange to you?" "Or would you know," pursued the ghost, "the weight and length of the strong coil you bear yourself? It was full and heavy and as long as this, seven Christmas Eves ago. You have laboured on it since. It is a ponderous chain!" What better way to begin Decembers Helpful Hints than with the enduring words of Charles Dickens. But lets remember too where Scrooge found salvation; not by dwelling in the past or worrying about the future, but by truly living, in the 'Now'. Christmas, 'Present' the ultimate gift to yourself! 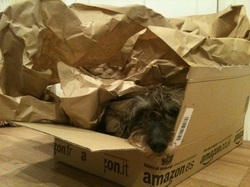 Dave the dog, IS Christmas 'Present'! "Scrooge was better than his word. Some people laughed to see the alteration in him, but he let them laugh, and little heeded them; for he was wise enough to know that nothing ever happened on this globe, for good, at which some people did not have their fill of laughter in the outset: and knowing that such as these would be blind anyway, he thought it just as well that they should wrinkle up their eyes in grins, as have the malady in less attractive forms. His own heart laughed: and that was quite enough for him!" The Spirit of Goodwill this Christmas. However, these days it rarely feels as if thats the case due to our eagerness as a race to label and judge; usually critically and harshly! This tendency is as a direct result of our addiction to thinking and forming opinions, but, what does the Oxford Dictionary say about opinions? Despite this, we treat our own opinions as if they are facts, carved in stone, real and irrefutable! So, why not practice avoiding the temptation to constantly think; labelling and judging and forming opinions. Opinions remember which, despite what your mind tells you, are not generally needed, helpful or true! If you do, you will notice something profound. You will be able to maintain the spirit of seasonal goodwill towards others throughout Christmas and beyond! If you are constantly thinking and overthinking or are struggling to keep your mind as quiet as you would like, please let me know! I hope the above may prove to be of some interest and help and if it is, please share it with someone you care about! I am currently enjoying the last few days of being in my forties and am very excited now as apparently life begins at 50! So, please have a wonderful Christmas and I'll be in touch in the New Year with an edition about how to stick to those elusive New Years Resolutions!